Pershing INSCRIBED Experiences in World War, World War John J. Pershing. My Experiences in the World War. Frederick Stokes, New York. First edition, 1931. Complete in two volumes. Hardcovers in jackets. 6 1/4 x 9 1/4 inches. xiv, 400; xii, 436 including index. With 69 reproductions from photographs and numerous maps. 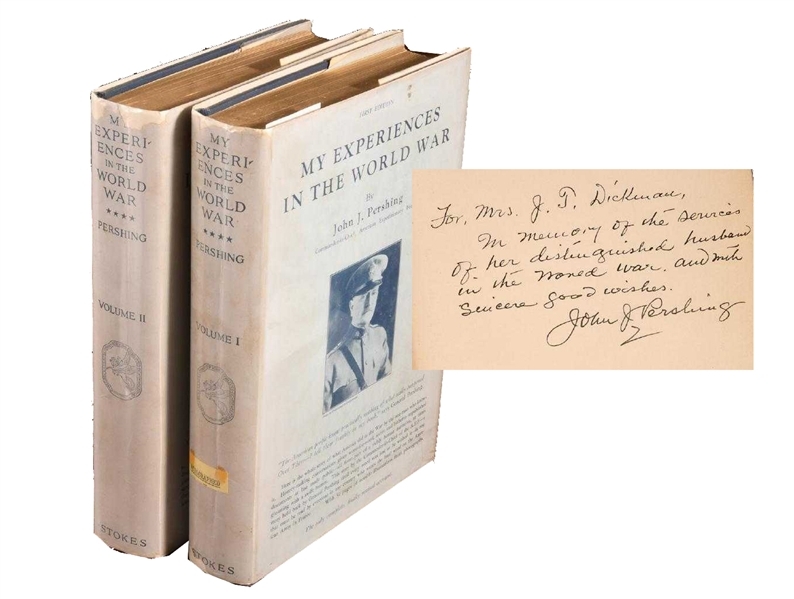 INSCRIBED to the wife of Major General J. T. Dickman and signed "John J. Pershing". Jackets of volume 1 price-clipped, both in archival protectors. This is the trade edition, not the "autographed" edition. 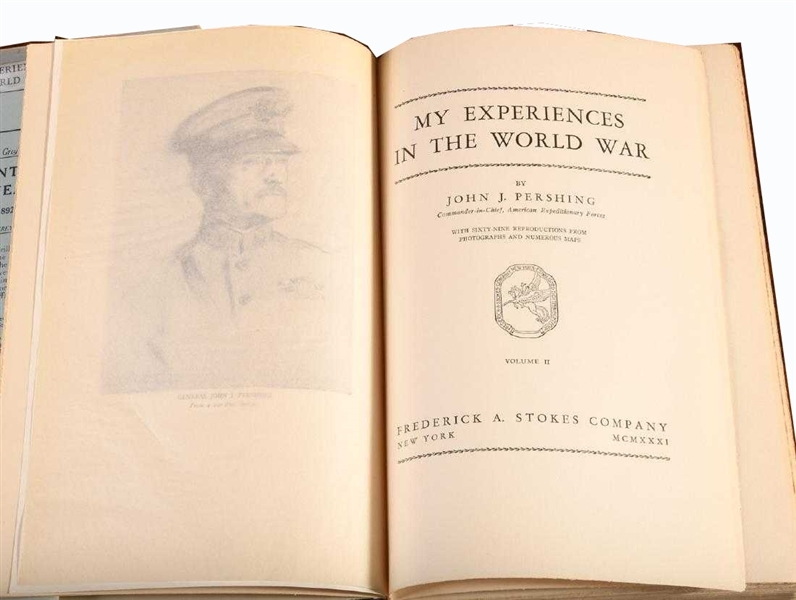 Provenance: Property from the Collection of Charles E. Sigety Important Pershing INSCRIBED Association copy of Experiences in World War, by John J. Pershing. My Experiences in the World War. Frederick Stokes, New York. First edition, 1931. 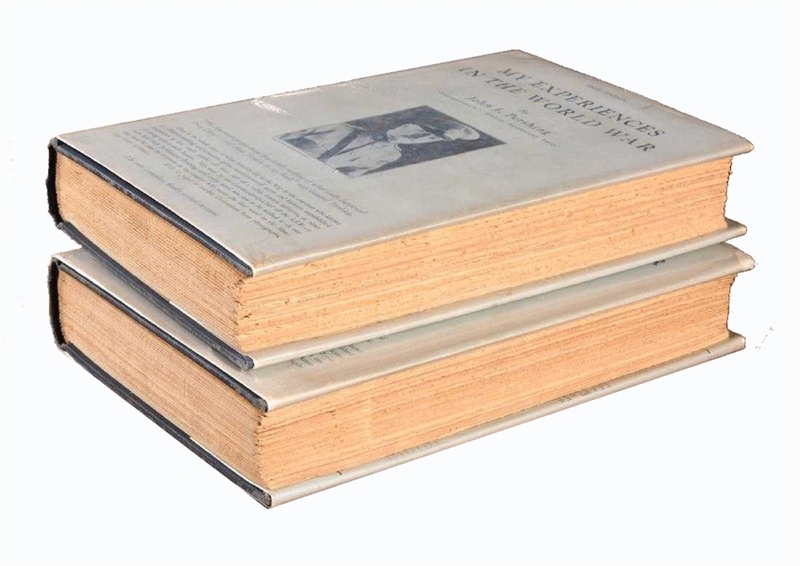 Complete in two volumes. Hardcovers in jackets. 6 1/4 x 9 1/4 inches. xiv, 400; xii, 436 including index. With 69 reproductions from photographs and numerous maps. INSCRIBED to the wife of Major General J. T. Dickman and signed "John J. Pershing". Jackets of volume 1 price-clipped, both in archival protectors. This is the trade edition, not the "autographed" edition. Provenance: Property from the Collection of Charles E. Sigety Joseph Theodore Dickman, KCB, (October 6, 1857 – October 23, 1927) was a United States Army officer who saw service in five wars, eventually rising to the rank of Major General. When the Third Army was established under the command of Dickman by General John J. Pershing in France to advance to the Rhein and hold the Coblenz bridgehead, then prepare to serve after the war as the Army of Occupation of the Rhineland. The Third Army would have become the Army of Occupation whether or not the enemy signed the peace agreement. American fighting units not sent home were consolidated under Third Army and prepared to attack if Germany did not accept the terms of peace. The United States itself was not to sign the agreement but remained technically at war with Germany for two more years.